Ghamorz is an Orc miner who lives in the Orc stronghold of Mor Khazgur. 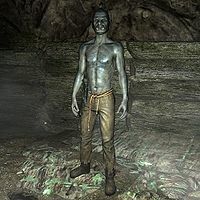 He works in Mor Khazgur Mine, an orichalcum mine located in the stronghold, with Gul and Olur. Ghamorz spends his entire life inside the mine and never sleeps. He divides his time between hacking away on the orichalcum ore veins, relaxing or eating. He wears a pair of ragged trousers and boots. He carries his pickaxe, a selection of common items and gold, and the key to Larak's Longhouse. This page was last modified on 11 December 2013, at 14:59.